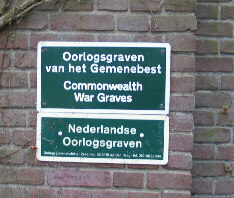 Enschede is located far further north than Arnhem, however on this cemetery nine soldiers are buried that where involved in Operation Market Garden, they are buried here together with airmen from South Africa, Great Britain and Canada who's aircrafts crashed in the area and with Canadian soldiers that died during the liberation of Enschede. 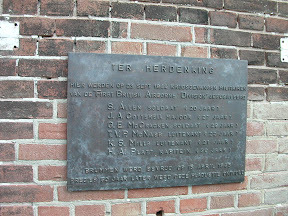 Plaquette in Brummen with the names of the victims. Source: David Tanner, UK. POW's from the 1st Airborne division had been gathered in Arnhem and from there where taken in open lorries towards a Prisoner of War camp in Germany. When one of the lorries drove through the village Brummen it slowed down. Two Airborne officers took their chances and escaped. A lorry coming from the opposite direction signaled the guards that the men had escaped. A your German SS soldier ran to the back of the truck and opened fire inside the truck on the unarmed POW's. One German guard was killed and four British POW's. 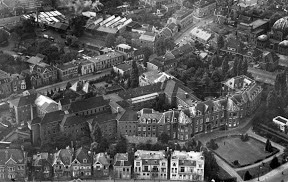 St. Jozef hospital in Enschede in 1945. These men where presumably also taken to st. Jozef hospital in Enschede and died there as a result of wounds they received during operation Market Garden. Conscripted into the British Army in 1940, talented journalist Anthony Cotterell was never going to be a natural soldier. Seeing that his abilities lay elsewhere, his superiors let him do what he did best—write. Within a few years, he was one of the Army’s top journalists, covering landmark engagements such as the D-Day landings, and became well-known in both civilian and military circles. He was then ordered to take part in the parachute drop at Arnhem in September 1944 as part of Operation Market Garden; he would never come home. Taken prisoner after the battle, on September 23, Major Cotterell was one of a group of British officers wounded when SS guards opened fire on the unarmed men. He then vanished without trace. In Major Cotterell at Arnhem, Jennie Gray tells the story of Cotterell’s mysterious disappearance, the SS war crime and the subsequent three-year search mounted by the War Crimes and Search Bureau, the British War Crimes Group, the Netherlands War Crime Commission and by his brother, Geoffrey Cotterell. Complemented by Cotterell’s own writings, official War Crime Group documentation and the daily letters written by Geoffrey—an author himself and with whose cooperation this book was written—it is a fascinating and poignant story of one man lost in the tumult of war.